Quality is an issue that affects everyone in the ad-tech industry ecosystem. 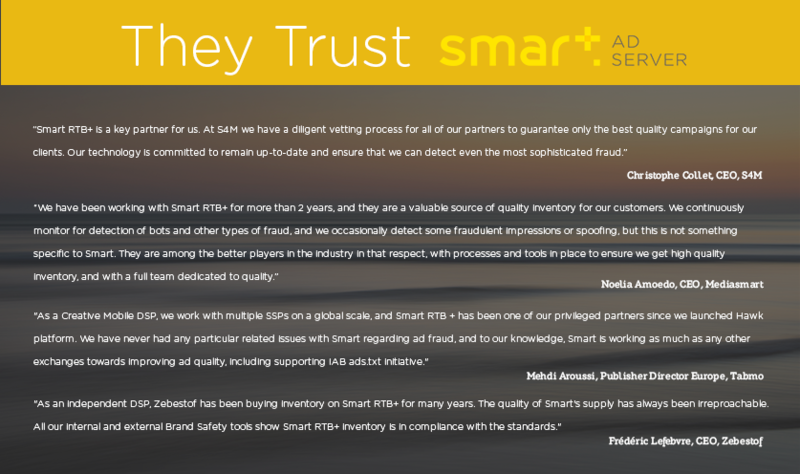 Smart AdServer was originally founded within a premium publisher, so quality awareness is part of our DNA. For publishers, quality can mean the creatives that appear on their websites. For buyers, quality signifies the sites on which their ads appear and the content that surrounds those ads. When an advertiser is willing to pay publishers for their inventory, publishers can’t afford to let bad actors spoof their domains. The bad actors are stealing those ad dollars, and eroding the value of the publisher’s audience and brand. The advertiser wants to reach an audience that actually exists and reward the publisher. DSPs and SSPs need to support this process by taking proactive measures to ensure the value exchange occurs securely and seamlessly. The IAB has taken an active role to help prevent bad actors from tricking buyers into purchasing fake impressions. Business Insider recently published an article explaining that Google has quietly conducted spoofing tests with some major media properties. While we look forward to learning the details of this test, we are generally supportive of Google’s efforts in this area and fully endorse the IAB’s Ads.txt initiative (more on this later). The Business Insider article includes a chart — unrelated to the Google study — illustrating a spoofed domain, and naming Smart AdServer’s Exchange, Smart RTB+. The chart shows the amount of impressions offered by exchanges (it does not show how many, if any, of these impressions buyers actually bought) for a particular site on a particular day (April 6, 2017). In the absence of proper context, charts like these can look shocking. After further investigation, we and others concluded that this particular domain sells its inventory on Private Deals only, but someone offered it on the Open Exchange. So it’s clear that a bad actor spoofed this domain. Current technology requires exchanges to deliver at least a few impressions before the exchanges can determine whether or not a particular domain has been spoofed. At Smart AdServer, once we flag a domain as having been spoofed, we block the domain until we can investigate it further and take appropriate action, because false positives also exist. The chart mentioned above, does show that a significant number of impressions were offered, but we’re confident that our systems detected the fraud/spoof and that buyers bought only a tiny fraction of those impressions. FraudLogix CEO Hagai Shechter said, “We have been working with Smart Adserver around brand safety measurement since 2016. They are very active in that field and created a dedicated Quality Department to protect their partners. Over the last 9 months, Smart AdServer’s percentage of ads detected as fraudulent is in line with the other leading SSPs in the market.” While it’s good that we are in line with other leading SSPs in the industry, it is clear that we all have more work to do. Smart AdServer uses standard fraud-detection vendors (such as IAS and FraudLogix), but also goes much further than typical industry standards. We use proprietary tools to block and quarantine suspicious URLs, and our Quality Team continuously monitors all reports in order to quickly take action against fraudulent activity. 4. Permanent dedicated R&D and market-level initiatives to improve the ecosystem. -To ensure the highest level of Quality, we put new RTB+ inventory through a strict scanning process that includes proof of a direct relationship with publishers or insertion orders. -Every participating publisher and ad network must comply with the Smart RTB+ Quality policy. -Before activating any inventory in the marketplace, Smart AdServer proactively provides the new inventory information to buyers for approval. This enables fluent communication and knowledge-sharing of any suspicious activities, which helps improve the entire ecosystem. As a member of the IAB, Smart AdServer enthusiastically supports the Ads.txt initiative. We consult Smart RTB+ publishers on implementation, and share suspicious information with our partners in an ongoing effort to remove bad actors from the ecosystem. We believe Ads.txt will play a crucial role enabling both SSPs and DSPs to block this inventory from unwanted resellers. Smart AdServer remains committed to combating fraud and waste, and ensuring the highest Quality marketplace for buyers and sellers. If our industry fails to improve the ad-tech ecosystem, we risk eroding the trust of buyers, which hurts everyone. We’re eager to hear your own perspective. You may reach our Quality Team can be reached at quality-team@smartadserver.com. N.B. Smart AdServer spoke with Mike Shields, the author of the Business Insider article in question, as well as with the company that provided the chart (Marketing Science Consulting Group), in order to fully understand their methodologies, and to share knowledge toward possible future collaborations. Smart AdServer is currently investigating (with the help of Dr. Augustin Fou of Marketing Science Consulting Group) the possibility of sharing the identity of the spoofed domain. The objective would be to block all of its domains from such spoofs, if they are not already blocked, and take any other actions that may be helpful. Update July 27th 2017: Dr. Augustin Fou of Marketing Science Consulting Group (the company that provided the chart) has confirmed that the mentioned publisher’s domain was already blocked by Smart AdServer back when the incident was identified.